Photo provided by Randi & Svein. Red Bay Basque Whaling Station comprises the archaeological remains of the largest pre-industrial whaling site in north-eastern Canada. The station was founded in the 1530s by Basque sailors, who made an annual transatlantic voyage to the site for summer whale hunting. They processed the whales in situ and took the oil home to Europe. The remains are mostly underwater or covered up. They include traces of buildings (including ovens for melting the whale blubber), whale bone deposits and shipwrecks. We visited this northern outpost in June 2018. This world heritage site is not the greatest, but our effort getting there, and the coastal surroundings made it one of the most memorable places on our Canada trip. We drove the inland route from Quebec along the St Lawrence Bay up to Baie Comeau and then route 389 some 590 km to Labrador. Further on the Trans Labrador Highway back to the eastern coast. It’s about 1600 km through desolate land, mostly paved but about 600 km is still gravel. At the most there are about 4oo km between settlements and gas. The isolated settlements or towns were fun to visit. We stayed overnight in Wabush close to Labrador city and in Happy Valley Goose Bay on the way. The next morning the wonderful weather continued, blue sky, no wind, perfect for exploring the site. The morning views from our cabin to the Saddle island was amazing. From the whaling station there is a boat service out to Saddle island every hour, 2 CAD, and we took the 9 am boat. As the only passengers we had the whole island to ourselves. Around the island there’s a self-guiding tour with information at every stop or “sight” and we had a map from the visitor center. Really there is not much to see, if you don’t know what you are looking for. There are remnants of rendering stations, support buildings, wharf and a cemetery. It was a nice and quiet morning stroll on the island. There are lots of birds nesting on the island. After an hour, the boat came and took us back. Still no other tourists in sight. The visitor center is small, but informative. It was interesting to learn how they discovered the history of the Basques whaling operations. They were searching the coast for remnants. On Saddle Island they found pieces of tiles that is typical on houses in Spain. There are also several wrecks in the harbor. The visitor center costs 8 CAD. It is part of the Canada national sites and we bought an annual pass. This turned out to be a good deal for us. In the beginning in of the 1500’s, for a period of 70-80 years, the Basque whalers used Red Harbor as a seasonal base for producing whale oil for sale in the European markets (used for lamp oil, cosmetics etc.). Each spring as many as 2000 men came to this coast to and set up their operations and to hunt Right and Bowhead whales. They had several bases along the coast, but Red Bay was the busiest because of the natural sheltered bay. By the 1580’s the number of whales had declined and the Basque whaling slowly ended. We took an afternoon drive to the other side of the bay and hiked up to the lookout of Tracy Hill, Amazing views of the bay and some icebergs. Then a short trip down to the Boney Shore with remnant of whale bones. Both trails are in the core zone and well worth the effort. A great stay in Red Bay, it is worth spending a night. Vi spent two nights and took the ferry to Newfoundland early next morning. Getting to Labrador requires a very long drive (8-10 hours) from the east coast to the west. Another option would be a flight into Deer Lake, but check on whether any rental cars are available first as this was an issue for us as were the drop off charges that were exorbitant? Enroute to the Ferry that goes to Red Bay, take the Viking Trail (route 430) which goes through gorgeous Gros Morne National Park, also UNESCO, which we planned to do on the way back. Also, consider a brief halt at The Arches Provincial Park along the way. It features a very photogenic Rock formation! Our GPS didn’t recognize tiny St. Barbe, the ferry town to Labrador, but just keep on the Viking trail and you will get there. Check out the ferry schedule carefully; we found that Friday had boats that allowed us to do a return day trip, unlike other days. The ferry is a pleasant two-hour trip. From the ferry dock in Blanc Sablon (actually in Quebec), it is a daunting one hour drive to Red Bay. The road is mostly potholes. A local quipped that we would wish it was a gravel road. In mid-July, we could see patches of snow near the highway. The weather was sunny but winds ranged from brisk to near gale force. The charming town of Red Bay is situated on a sheltered sea, which made it ideal for whaling in days of yore. The visitor’s centre is a museum dedicated to the story of the Basque whalers who travelled here to ply their trade. Clothes, astrolabes and other sea tools and ruined ships were found to document the Basque presence in this area. The Museum does a fine job of detailing the whaling life, but the piece de resistance is a 5 minute (weather permitting) $2 boat ride to Saddle Island. This isle has a fairly easy to walk trail with artefacts of the whaling industry including ovens, an old house and a large rusting wrecked ship and indications of where Basque finds had been made. The trail has lovely views and is well signed, making it a very fine one hour walk just in time for the boat pick up. Whalers is a restaurant with nice folks and great fish and chips just across from the Museum. This very enjoyable site was enhanced by the uniqueness of Labrador and its People! Red Bay Basque Whaling Station is a quite new World Heritage Site (2013), but definitely worth it's UNESCO-status. It is an amazing place to visit, both the history and the stunning surroundings make this a very nice experience. The history of the Red Bay Basque Whaling Station is told at the Visitor Centre, which is informative and well-organized, but not very big. 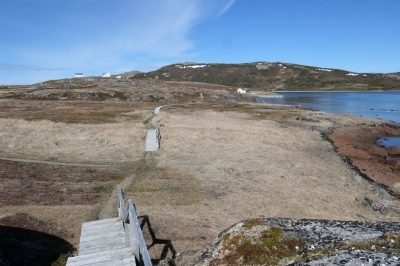 The main sight, Saddle Island, was closed on our visit due to birds nesting (mid-June). 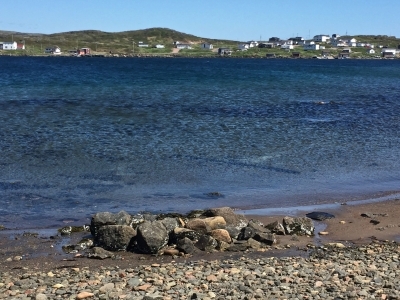 A boat will normally take you out to Saddle Island where one can stroll around and look at the remains of the whaling station, including the old cemetery. The many shipwrecks in and around the bay are an important part of the UNESCO-status. At the Visitor Centre one can see one of the smaller basque vessels, the chalupa. We were truly amazed by the beautiful surroundings of Red Bay, including the magnificent icebergs drifting past. We drove up from Blanc Sablon, where one can arrive by ferry from Newfoundland, and the hour-long drive was stunning. If you visit Newfoundland and the wonderful UNESCO-sights Gros Morne and L'Anse aux Meadows, be sure to take the detour to Labrador and Red Bay. Cultural sites taking up an entire island: Among several completely inscribed islands is Saddle Island which contains the "Try-works" (furnaces for rendering whale oil from blubber) of the whaling station and other cultural remains.